Description: • Analog Control Compatible. Realistic 3D flight simulation enhances the dogfights in this thrilling return to WWII-era combat aviation. Take to the skies in planes that handle just like vintage craft -- in missions where quick reflexes and split-second timing are the only things between success and doom! Every mission you complete has a reward - a new plane to add to your hangar! Authentically recreated planes from the 30's and 40's! Take on enemy forces in strafing runs against fortifications or in 1-on-1 aerial dogfights! Create a squadron of planes using the custom-design feature! 05-14-2018 Flashback2012 Description • Analog Control Compatible. 05-13-2018 Flashback2012 Box Text Control the Skies and You can Control the War Realistic 3D flight simulation enhances the dogfights in this thrilling return to WWII-era combat aviation. Take to the skies in planes that handle just like vintage craft -- in missions where quick reflexes and split-second timing are the only things between success and doom! Every mission you complete has a reward - a new plane to add to your hangar! Authentically recreated planes from the 30's and 40's! Take on enemy forces in strafing runs against fortifications or in 1-on-1 aerial dogfights! Create a squadron of planes using the custom-design feature! 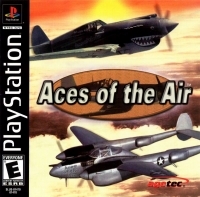 This is a list of VGCollect users who have Aces of the Air in their Collection. This is a list of VGCollect users who have Aces of the Air in their Sell List. This is a list of VGCollect users who have Aces of the Air in their Wish List.